Quick analysis: September was a mixed bag in consumer litigation and complaints. On the one hand, FDCPA and TCPA lawsuits were down a bit from their numbers in August, 6.5% and 5.5% respectively. On the other hand, FCRA litigation was up quite a bit, 8.9% over its number in September. Overall, litigation rose in September (1272 consumers filed suit last month over August’s 1222 consumers). Even with FDCPA and TCPA down in the monthly horse race, everything is still tracking up for the year, with FDCPA and FCRA still very strong ahead of 2014 (17% and 36.3% respectively), and TCPA finally (finally!) starting to widen its YTD lead over last year with a still-anemic 3.5% increase. 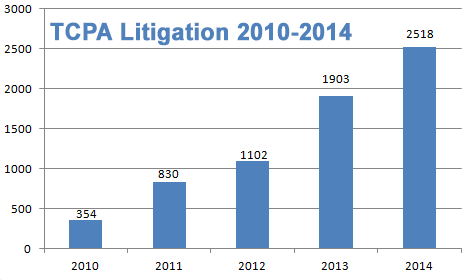 Keep in mind, the TCPA bar chart has been the most dramatic over the last several years (see below graphic). It has all but flatlined so far this year, all the more remarkable because of case law and regulatory declarations that one would have expected to delight the consumer bar. There have been predictions of TCPA’s resurgence later this year… at this point it is looking like it we will run out of year before any significant movement happens in TCPA litigation growth again. CFPB complaints against debt collectors also are looking down, a whopping 16.3% in September. That brings it to one of its lowest numbers in recent memory, just barely cracking 3000 complaints (3025, for the record). Expect this number to go up by 5-10% in the coming weeks as new complaints trickle into the public record, but even so that makes for the lowest month this year unless a large batch pops up unexpectedly. For September 2015, about 32% of all consumer litigation plaintiffs had sued at least once before under consumer litigation statutes. About 822 different companies were sued, and 765 different debt collectors were complained about to the CFPB. Class actions were mixed, with a big 16.2% for FDCPA, a huge 28.1% for TCPA and a low 8.7% for FCRA. The Illinois Northern District Court in Chicago had the most litigation filed in it, with 71 consumers represented in litigation there. California had the most CFPB complaints against debt collectors, with 415. Of those plaintiffs, about 409, or (32%), had sued under consumer statutes before. About 822 different collection firms and creditors were sued. There were 3025 complaints filed against debt collectors from Sep 01, 2015 to Sep 30, 2015. This includes 2822 (93%) timely responses to complaints, and 203 (7%) untimely responses. Of the company responses, consumers accepted 0 (%) of them, disputed 294 (10%) of them, and 2731 (90%) were N\A.